Service for others is the greatest gift of yourself. 2nd Annual Service Outreach Day Benefiting Local Charities. In honor of Jacob Marek's 17th birthday. Sunday, December 3rd at Golf Center at Kings Island. Open House and Donation Drop Off 2:00-6:30. Prayers Service & Celebration 6:30. Celebrating the way Jacob would have celebrated... helping others. 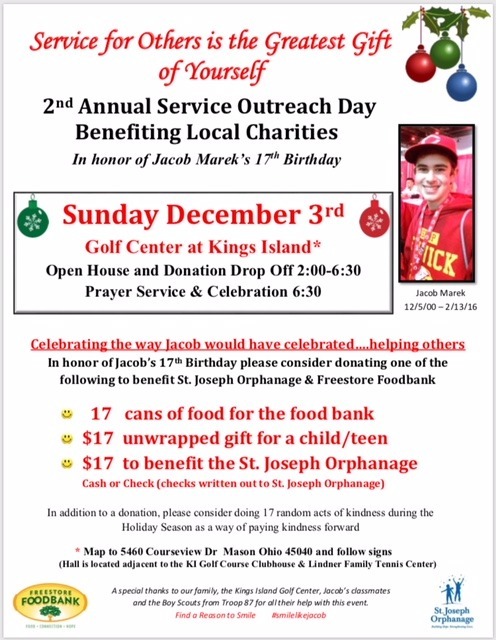 In honor of Jacob's 17th Birthday, please consider donating on e of the following to benefit St. Joseph Orphanage and Freestore Foodbank. 17 cans of food for the food bank. $17 unwrapped goft for a child/teen. $17 to benefit the St. Joseph Orphanage. Cash or check (checks written out to St. Joseph Orphanage). In addition to a donation, please consider doing 17 random acts of kindness during the Holiday Season as a way of paying kindness forward.